If you are planning to use biological control for spring crops, then plan to take some important steps three months prior to releases. The success of any biological control program relies on patience and a commitment to detail such as sanitation, scouting and record-keeping. Greenhouse sanitation and disinfecting are steps that growers can take now to prepare for the spring growing season. Clean as early as possible to eliminate over-wintering sites for pests to reduce their populations prior to the growing season. Greenhouse pests will over-winter in weeds and protected areas in unheated greenhouses and especially during years with unseasonably warm temperatures. Remember that pests are much easier to prevent than to cure. Begin by thoroughly cleaning the floor of soil, organic matter and weeds. Pay particular attention to areas around furnaces or along side walls where small weeds may exist. Install physical weed mat barriers if floors are bare dirt or gravel and repair existing ones. Weed barriers not only prevent weeds, but also make it easier to manage algae. Avoid using stone on top of the weed mat that will trap soil and moisture, creating an ideal environment for weeds, diseases, insects and algae. Fix any low spots or poorly drained areas in the greenhouse that allow water to accumulate. Benches, preferably made of wire, should be disinfected and pots, flats and trays should be either new or disinfected. Bench tops and work tables should be made of a non-porous surface such as a laminate that can be easily disinfected. Avoid using bare wood for these tasks. Disinfect hose nozzles, hang hoses to keep ends off the floor and provide a clean and covered area for growing media. Avoid holding plant material and contaminated pots, media or debris in the media mixing area. Disinfect the growing and plant handling areas, and irrigation system. There are several different types of disinfectants that are currently used in the greenhouse for plant pathogen and algae control. They are quaternary ammonium compounds (Green-Shield®, Physan 20®, and Triathlon®), hydrogen dioxide (ZeroTol®, Oxidate®) and chlorine dioxide (Selectrocide™). All these products have different properties, so read and follow label directions. Chlorine bleach may be used for pots or flats, but is not approved for application to walls, benches or flooring. Alcohol is flammable and therefore not used as a general disinfectant. However, it is useful as a dip or swipe treatment to disinfect propagation tools. If possible, disinfectants should be used on a routine basis both as part of a pre-crop clean-up program and during the cropping cycle. Organic growers have fewer options for disinfectants. Oxidate® is the only material mentioned above that is currently listed by the Organic Material Review Institute (OMRI), see www.omri.org. Ethyl or isopropyl alcohol is also allowed under the organic standards. Organic growers should always check with their certifying organization before using any material new to their growing practices. Check weeds around the greenhouse perimeter for aphids and other pests. When weather permits, use horticultural oil on weeds outside, around the greenhouse perimeter to smother over-wintering pests such as aphids. Then clean up the weeds this fall to prevent pests next spring. Finally, pest population will be reduced significantly with a fallow period of four weeks, but having an empty greenhouse for even two weeks can help. Before placing plants in a greenhouse this winter, place yellow sticky cards throughout the greenhouse and on the floor after watering benches and the floor to detect over-wintered thrips (emerging from pupae), fungus gnats, whiteflies or other insects, Close up the greenhouse and turn on the heat to break dormancy. Observe cards after a few days. Also place a few sticky traps on the outside perimeter of the greenhouse, especially under vents to detect pests. When treating inside the greenhouse (prior to releasing biologicals) use low residual materials such as insecticidal soap and horticultural oil. If planning to use biological control, it is important to phase out the use of pest control materials in the organophosphate, carbamate, and pyrethroid chemical classes prior to releasing natural enemies since many materials in these chemical classes can persist for up to four months in the greenhouse. For more information on the compatibility of pest control materials with natural enemies refer to on-line databases, such as Koppert Biological Systems, or Biobest Sustainable Crop Management. Check under "Side Effects." Research is continuing on the compatibility of pest control materials with natural enemies. In addition to sanitation and phasing out the use of residual pesticides, a good monitoring program must be in place. Detecting problems early is essential, since beneficials are introduced at the first sign of an infestation. It is also important to monitor weekly throughout the crop cycle to help decide future releases and to know what is working or not. A 10X hand lens will help to identify pests and beneficials. Knowing the major insects, mites and diseases prone to the crop and how to recognize beneficials is essential. Other considerations include establishing a supplier in advance, having someone available when shipments arrive and checking shipments for viability (remember they are living organisms). If this will be the first time using biological control, it is recommended to try it in a small isolated greenhouse, in propagation houses, or in a greenhouse where edible crops such as herbs are being grown. This will allow you to obtain experience and then have the opportunity to expand into other production areas. Greenhouse IPM Manual with Emphasis on Biocontrol by Penn State Univ. Using Beneficial Nematodes by Leanne Pundt, University of Conn. and Tina Smith, University of Mass. Ball Guide to Identification of Greenhouse Pests and Beneficials by Stanton Gill and John Sanderson. ISBN-10: 1-883052-17-3, 256 pages. Knowing and Recognizing: The Biology of Glasshouse Pests and Their Natural Enemies, Second Edition by M. H. Malais and W.J. Ravensberg. 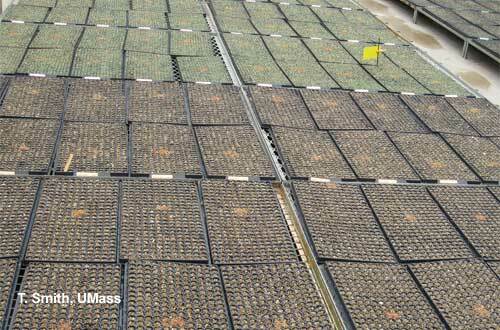 New England Greenhouse Floriculture Guide. A Management Guide for Insects, Diseases, Weeds and Growth Regulators. From New England Floriculture Inc. Ordering information. This new guide features new practical information for using biological controls.